It is my great pleasure to introduce Dr. Daria Svidzinska from Taras Shevchenko National University of Kyiv in Ukraine as our GeoAmbassador. Daria established GeoforAll lab at her university  and has been actively expanding geoeducation opportunities for all. Daria Svidzinska defended her PhD in physical geography at Taras Shevchenko National University of Kyiv, Ukraine in 2007. Since then she has been working as a professor at the Department of Physical Geography and Geoecology. Her research and teaching in the areas of landscape ecology, habitat mapping, protected areas, and ecological networks stimulate constant pursuit for better analytical tools and complex sources of geodata. With the time she understood that Free and Open Source Software coupled with Open Geodata can help to sustain best practices in research and teaching through ensuring freedom and reproducibility. In 2014 she published a textbook called ‘Methods of Geoecological Research: a geoinformational tutorial based on the Open Source GIS SAGA’ under Creative Commons License. It became the very first university textbook in Ukraine (and post-soviet countries) based on open source software and open geodata exclusively. She also actively promotes open source GIS among students and young researchers through her courses such as ‘Methods of Geoecological Research’, ‘Geospatial Ananlysis for Landscape Research’, ‘Design of Ecological Networks’. These courses discuss concepts, methods, and tools for mapping, analysis and modelling of landscape spatial patterns and processes, landscape-ecological basis of ecological networks development, approaches and methods of their design and management. Approaches and algorithms of advanced geospatial analysis and modelling are covered with the focus on digital relief modelling, geomorphometry, hydrological analysis, and thematic classification of remote sensing data. Practical part of the courses requires the development of analytical process, that combines a few open source geospatial software tools (for example, QGIS, SAGA, GRASS, Orfeo Toolbox, Circuitscape etc.) to solve an applied problem. Daria is also involved in local training for colleagues from the other areas of expertise who would like to become more powerful GIS users. 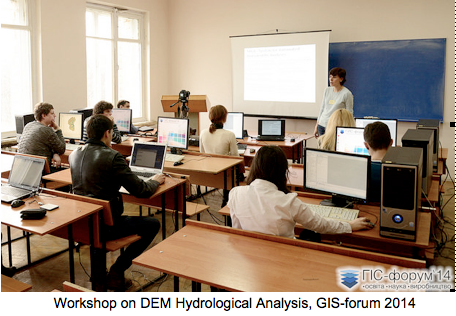 She gives workshops and provides counseling to promote FOSS GIS use and adoption in Ukraine. 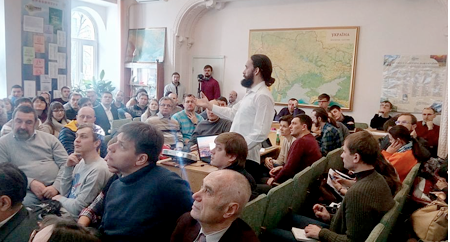 In January 2016 jointly with her colleagues from the Institute of Geography of National Academy of Sciences, she organized the first meeting of the Ukrainian FOSS GIS users which attracted over 100 attendees. FREEWAT is a project of the EU framework program for research and innovation HORIZON 2020. 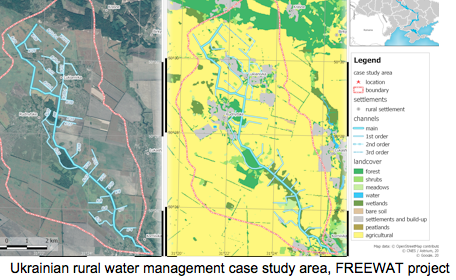 FREEWAT main result will be an open source and public domain GIS integrated modelling environment for the simulation of water quantity and quality in surface water and groundwater with an integrated water management and planning module. Within the project we are focusing on the application and approbation of the FREEWAT tools for the research aimed at improvement and development of integrated rural water resource management scenarios that take into account the requirements of the EU Water Framework Directive. Ukraine is a contracting party (member state) of the Ramsar Convention on Wetlands of International Importance especially as Waterfowl Habitat and there are over 30 sites in its territory placed onto the List of Wetlands of International Importance. In cooperation with the Ministry of Ecology and Natural Resources of Ukraine, we are working on actualization of geodata and update cartographic materials for existing and perspective wetlands of international importance in accordance with the requirements of the Ramsar Convention Secretariat. Despite the goals and requirements of national and international environmental policy and legislation, Ukraine does not have a single, reliable and publicly available tidy geodata source of current importance on protected areas. This significantly complicates their protection, monitoring, management, and research. Understanding importance of the issue, we have joined a civil crowdsourcing project, initiated in 2014 by the specialists and activists in the areas of nature conservation, geoinformatics, and open data. The project is aimed at the mapping of the boundaries of protected areas of Ukraine in the OpenStreetMap and development of the derivative open geodata on this basis. 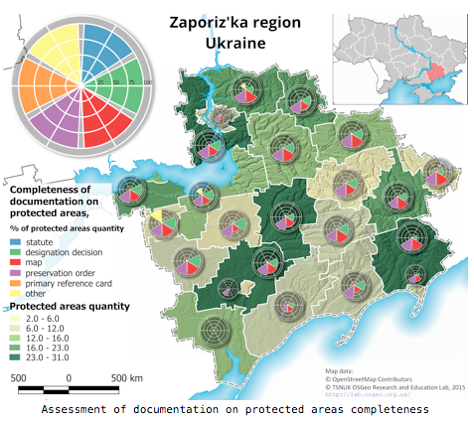 The procedure of mapping pays a special attention to the protected areas of local importance which make up over 90% of total quantity and about 50% of total area of all protected areas in Ukraine. 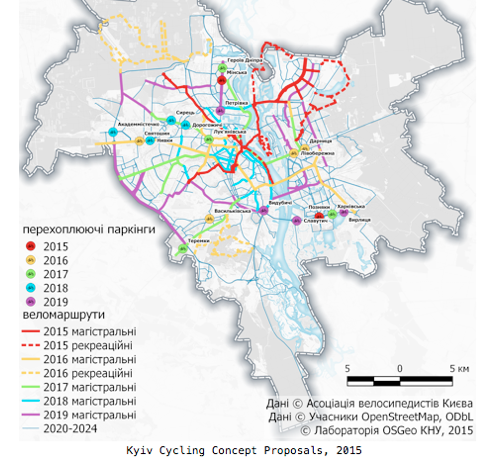 In 2014 Kyiv Cyclists’ Association initiated the collective development of the scheme of cycling network and related measures for Kyiv. In this project we provided geospatial analysis and mapping, which were based on the joint use of the OpenStreetMap data and QGIS tools. In addition to applied use of open geotechnologies, Daria and colleagues at GeoForAll lab also work on the translation of documentation and interface to make QGIS more accessible for the Ukrainian users. As the part of these activities Semi-Automatic Classification Plugin User Manual version 2.5.1 was translated into Ukrainian, and translation update to the current version is in progress. I am sure Daria will expand these ideas for the future. We are looking forward to building strong research and teaching collaborations worldwide in Open Geospatial Science. We are proud to honour Daria as our GeoAmbassodor and we are extremely grateful for her contributions to Geo for All. This entry was posted in OSLabs, Policy by Suchith Anand. Bookmark the permalink.